Nokia 9 PureView made headlines for its unique and one-of-a-kind camera placement when it was launched last month at MWC 2019 in Barcelona. But now, the smartphone is all set to be launched in India. HMD Global’s Nokia teased about the launch through a video which they posted on their official Nokia Mobile Facebook page. The Nokia 9 PureView comes with a penta-rear camera setup which includes three-monochrome and two RGB sensors. The Nokia 9 PureView carries a price tag of $699 (approximately Rs 48,300) in the global markets. But the smartphone’s price in India has not been revealed by the company yet. However, we can expect the cost to be similar to the global pricing of the device, and the handset might bear a price tag of around Rs 50,000. The Nokia 9 PureView comes in only one colour option – Midnight Blue. Nokia 9 PureView sports a 5.99-inch Quad-HD+ (1440 x 2960 pixels) resolutions POLED display with an aspect ratio of 18.5:9. The smartphone is powered by an octa-core Qualcomm Snapdragon 845 SoC coupled with 6GB of RAM and 128GB of internal storage. According to the HMD Global, it has worked closely with Google and Qualcomm to optimize the camera experience of the Nokia 9 PureView. The device packs a 3,320mAh battery with support of wireless charging. Get ready to capture the most breathtaking pictures with the all new Nokia 9. Stay tuned! The cameras are the major focus point of the Nokia 9 PureView, it has a penta-rear camera setup which has been developed by the company in collaboration with Light. The device houses five rear cameras which comprises of three 12MP monochrome sensors along with two 12MP RGB sensors. All the cameras are powered by Zeiss-certified optics. While at the front, there is a 20MP selfie camera. 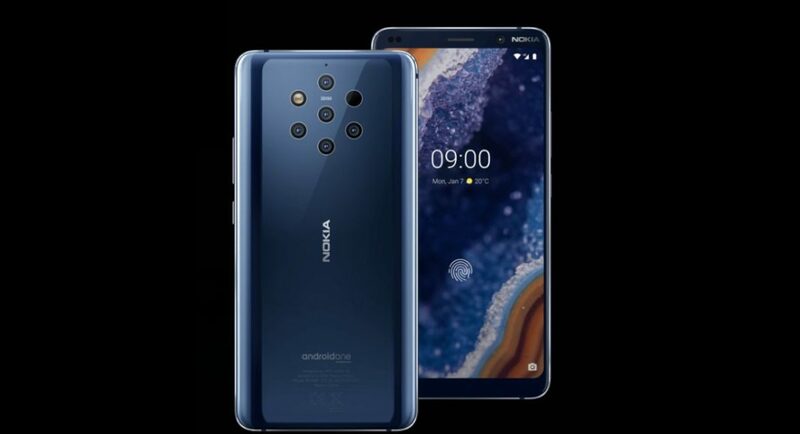 We should mention that Nokia 9 PureView is the first smartphone in the world to come with five cameras on its back panel. Other features of the Nokia 9 PureView include 4G LTE, Wi-Fi 802.11ac, Bluetooth v5.0, GPS/ A-GPS, NFC, and USB Type-C.